There is an exciting new art exhibit ready for viewing at the NCA Art Gallery located in the Fairfield Bay Conference Center. The Art Gallery has a lot of new artist. The word is getting around to artist throughout the state about our beautiful art gallery and scenic area. Our community, surrounding areas, and timeshare visitors are learning about the quality of fine art represented in the Art Gallery. We are especially pleased that our young people are being exposed to quality fine art. This month’s feature artist lives in Fayetteville and a well renowned artist. Gary Johnson, born in Michigan, is now a Fayetteville resident and self-taught artist. While living and working in the Pacific Northwest he initiated the development of his skills in watercolor and acrylic painting. Gary has taken numerous classes and workshops from professional artists. He continued his development in South Carolina and now Arkansas through continued participation in workshops and self-study. Gary was educated in engineering and business with both bachelor and master degrees and has traveled extensively through China and other Asian countries, Europe, and Australia. He’s worked in many parts of the US and Mexico and enjoys traveling to places unvisited to develop new ideas for his art by being a keen observer of surroundings he visits and paying particular attention to color, shape, and value. Gary’s works hang in Washington, Washington DC, California, Arkansas, Arizona, Pennsylvania, Florida, South and North Carolina, Wisconsin, Texas, and Michigan. Gary is a member of the AWS, ANA, MSW, and SCWS where he is a Signature Member in Excellence after having been juried into their annual shows in 2009, 2010, 2011, and most recently 2014. He received an award from the Renaissance Interior Design center during the 2011 annual juried show in Anderson, SC. He’s also been juried into the ANA’s 22nd Annual Regional Art Exhibition in 2016, the 2017 MSW’s 46th Annual Juried Exhibition, and the 2017 “Flight” Exhibition at the Tubac, AZ Museum of Art. Gary is represented by the Art Emporium in Fayetteville. 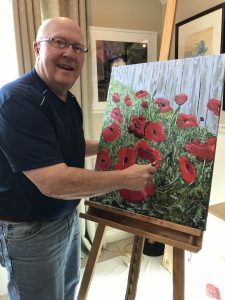 Gary’s interests are wide ranging from still life and flowers to landscape, portraits, wildlife and abstract and experimental. His work ranges from small detailed studies to broad natural themes in which he experiments with color, texture, perspective, and shape to achieve works that evoke an emotional response and to develop his ever-growing love of the media. The NCA Art Gallery’s mission is to bring quality fine art with family values to our community. The exhibit is open for all artists that are 18 years of age. A selection committee choses the art and changes the exhibit bi-annually. The artists with artwork selected for the new art exhibit are the following: Painters-Judith Beale, Julie Caswell, Jan Cobb, Annette Garner, Joyce Hartmann, Pamma Henderson Bonnie Hookman, Joyce Hubbard, Gary Johnson, Sarah Johnson, Ellen Kelly, Jun Kim, Rebecca Loftis, Sandra Marson, Sue Pico, Charlotte Rierson, Faye Rodgers, Pauline Sears, Diana Shearon, Ann Snyder, Mary Ann Stafford, Dianne Traylor, Susan Waggoner, Cathy Wester, 3 Dimensional Art-Barbara Cornett, Karen Gehl, Linda Pledger, Anne Mitchell , and photography-Brandi Vandygriff. The artists come from Fairfield Bay, Greers Ferry, Heber Springs, Conway, North Little Rock, Little Rock, Jacksonville, Edgemont¸ Mt. View, Benton, Clinton, Maumelle, Mt. Vernon, Shirley, Maumelle, and Fayetteville. Art Gallery hours are Mon. – Fri., 9:00-4:00 (unless special events then hours are extended). The viewing of the Art is open & free of charge to the public. All art is available for purchase. The NCA Art Gallery is sponsored by the North Central Arkansas Foundation for the Arts & Education (NCAF&E) and The City of Fairfield Bay. For more information about the Art Gallery, contact NCA Art Coordinator, Charlotte Rierson – 501-884-6100, email [email protected] or Conference Center Directors, Wilba or Bob Thompson for more information- 501- 884-4202, [email protected], 110 Lost Creek Parkway, Fairfield Bay 72088.